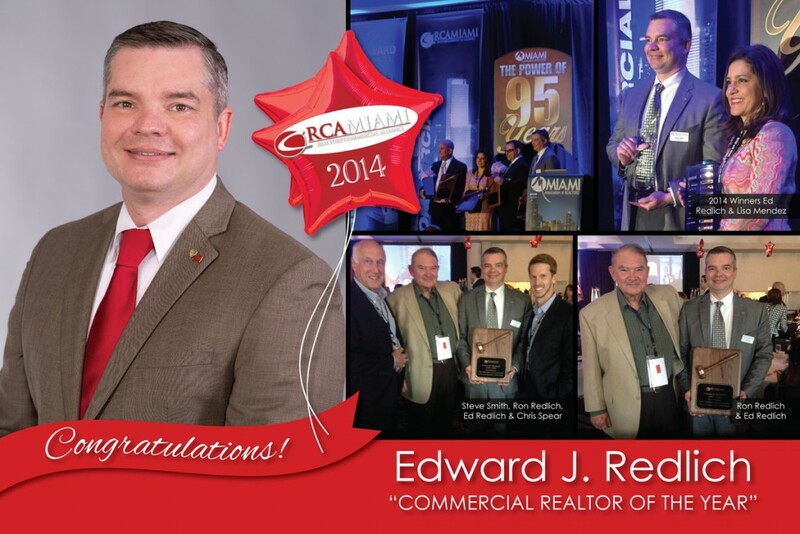 The ComReal Companies are proud to announce that Edward Redlich has been selected as the “2014 Commercial Realtor of the Year” by the Realtor Commercial Alliance (RCA) of Miami. RCA Miami is one of the largest commercial Realtor organizations in the country with approximately 1,700 active members in South Florida and is part of the Miami Association of Realtors (MAR) which is the 2nd largest board of Realtors in the world with over 141,000 members in South Florida. RCA Miami members specialize in office, industrial, retail, multifamily, investment and other commercial disciplines. Redlich served as the 2014 Commercial President for RCA Miami and is currently serving as the 2014-2015 President of the Society of Industrial and Office Realtors (SIOR) Florida Chapter, which is comprised of nearly 180 members. In addition, he is the Vice Chairman for the Commercial Alliance Committee with Florida Realtors which has over 141,000 members. Although he volunteered heavily with all of these organizations, Redlich still made time to lead his team to book over $45,000,000 worth of sales/lease transaction volume in 2014. Redlich is a native Miamian, graduate of Florida International University (FIU) and has been a licensed Realtor for two decades. Redlich comes from a real estate family, joined by both parents and a sister, who have all been affiliated with the profession. Congratulations! Not only are you so deserving of this award but it is always such a pleasure working with you. You are professional and always take the steps to close the transactions in a prompt and efficient manner. You are the best example of what all real estate professionals should be and a tough act to follow. Thank you for sharing your knowledge and your friendship. Sylvia R.
Good job Ed! Many congrats!